Northeast of Antalya on the Side road take the turn off for tasagil and beskonak, for the beautiful circular, scenic route that leads to the Koprulu Canyon National Park. The road crisscrosses over the clear, flowing water of the mountain river and passes through virgin forests and over rippling waterfalls. You will want to stop often and give your camera workout in this picturesque valley. 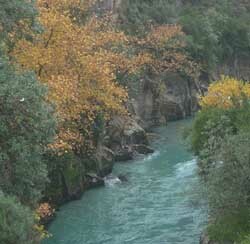 reaching the park, 92 km from Antalya, you will encounter a valley of wild beauty rich in flora and fauna. The canyon stretces for 14 km along the Kopru River and is 400 meters deep in some places. At the rest area there are fish restaurants offering delicious selections. The Roman Oluk Bridge over the canyon and the Bugrum Bridge over the Kocadere stream were engineering feats in their time. From this park there are two other possible excursions; the ancient city of Selge and the Dedegol Mountains. The highest peak in this mountain range is dedegol at 2992 meters. Mountaineers will be unable to resist climbing, exploring and camping in this rudged, scenic spot. Return to Antalya via the other half of the scenic route.